On his recent trip home, Fr. Suresh had chance to review the apostolate in his home country first hand. Here is his report on the work of the Society in this vast sub-continent. Whenever people think about India the first thing that springs to mind are the tales of sacred cows and the river Ganges! Although it is true that most part of India is still pagan, the good Lord has, however, blessed this country in many ways. In fact India was evangelized by three Saints and sanctified by the blood of two Martyrs. The first one to evangilize India was St. Thomas the Apostle, martyred there in A.D. 72. Then the great missionary St. Francis Xavier S.J. (+1552) evangelized India and converted thousands of Indians. The last missionary Saint to evangelize India was St. John De Britto S.J., martyred there in A.D. 1693. All three of them worked mainly in the southern part of the country, from Goa to Cape Comorin. Ever since, the Catholic faith has grown in this region sanctified by the blood of Martyrs and this is where the Society of Saint Pius X is now doing its missionary work. I was able to see the Society’s apostolate more closely during my holiday in India. There are three priests of the Society who are working there presently. Fr. Thomas Blute (American) is the Prior and he is assisted by Frs. Edwin Alphonse (Indian) and Angelo Van der Putten (American). There is one priory, one boys’ hostel and eight Mass centres under the care of the Society. The number of the Traditional Catholics is about 600. The main part of the apostolate is to say Mass in these Mass centers, which are scattered all around the southern region, covering about 1800 kms. from the South going up North, as far as Bombay. Apart from this, the priests print a bi-monthly bulletin called “The Apostle”, run a full time boys’ hostel and contact those local priests who are sympathetic towards tradition. 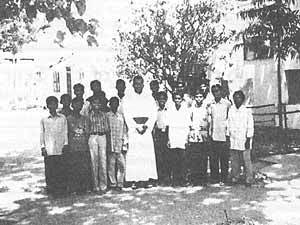 The boys’ hostel gives shelter to the Catholic boys who come to the town for their studies on the condition that they attend the Tridentine Mass and follow the rules of the Society. The purpose behind this is to attract the young Catholic boys, both traditional and conciliar, towards Tradition and foster priestly and religious vocations. It has proven to be fruitful as there are few vocations on the way now. The work of contacting the local priests has also proven to be successful, as there are 8 priests who are now our friends and, four among them are saying the Tridentine Mass. The Society has been in India since 1987 and India has produced two priests, one seminarian for the Society and five religious vocations to the other traditional orders. After about 10 years of hard work and struggle, the Society’s apostolate is now well consolidated. This consolidation is most evident in the fact that the apostolate is bearing fruit that is clearly visible. I asked Fr. Thomas Blute – the prior – about the apostolate. He said, “Now we can truly say that the hard work of the past is bearing its good fruit”. He further says that the Society has just purchased two acres of land in the town of Palayamkottai, where the priory is situated. On the land will be built a new priory, chapel, convent, boys’ hostel, and eventually trade schools and workshops. It was the last big open space in this town of 5 million people, and consequently invaluable. The works for the new building will begin soon. The presence of the Society in India is very important during this post-conciliar revolution in the Church. The conciliar bishops and priests are working successfully at their inculturation into the liturgy. Catholic theology is no longer taught in the seminaries. The seminarians are learning more about various incarnations than the theology of Our Lord. Recently, five Novus Ordo seminarians left their seminary in Bombay to join the Society because they could no longer put up with all this nonsense. But times of crisis bring forth champions of the Faith and that is why we have good reason to hope and pray that more Catholics open their eyes to what is really happening in the Church actually and aid the resistance by coming back to tradition and from there help to continue the work of evangelization begun by St. Thomas.